In early January of 2010, the Zinn Education Project joined with HarperCollins, publisher of Howard Zinn’s classic A People’s History of the United States, to sponsor an “Ask Howard” online radio interview, and invited teachers from around the country to participate. Sixty teachers and students submitted written questions to Professor Zinn. The Jan. 19 interview was conducted by Rethinking Schools curriculum editor and Zinn Education Project co-director Bill Bigelow. Here are excerpts from that interview, edited for length and clarity, and originally published in Rethinking Schools. Bill Bigelow: Howard, thank you for agreeing to answer teachers’ questions about teaching a people’s history. 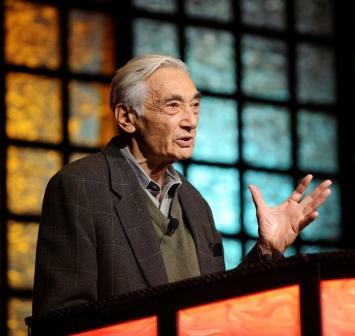 Howard Zinn: How could I refuse? Bigelow: With the horrific events of the last week, I’d like to begin with Haiti. Randall Robinson, the founder of TransAfrica Forum, was on Democracy Now! recently, and he said that now is an opportunity “for the American people to at long last learn the full truth about Haiti and about our relationship with Haiti.” What do you think this means for history teachers? What should we be teaching to help students make sense of what’s going on there today? Zinn: The first thing we ought to recognize is that in American education we learn nothing about Haiti — which is remarkable. Think of how close Haiti is to us and how significant Haiti is. Haiti’s was the first war for independence in this hemisphere after the American Revolution. Haiti was an independent republic. It had fought against Napoleon’s France, stimulated by the French Revolution, and then had won independence. This was a remarkable thing. The United States, interestingly enough — and this is the first thing that people should know because it is such a forerunner of what happens in the next several centuries — the United States, which had just gone through a revolution itself, refused to recognize the independent country of Haiti, refused to recognize the revolutionary regime. And from that time on, the United States’ relationship to Haiti has been paternal, imperialist, negligent. So we become the richest country in the hemisphere and Haiti the poorest country in the hemisphere, and the United States does nothing to alleviate the poverty or help the people of Haiti. In fact, just the opposite: The United States maintains and supports the brutal military regime of the Duvalier government in Haiti after World War II. And the United States is hostile to the first popularly elected president of Haiti, [Jean-Bertrand] Aristide. And the United States has essentially carried on an embargo against Haiti, which has kept that country poor. And in recent years the International Monetary Fund, which is mostly a creature of the United States, has ruined Haiti’s agricultural situation, preventing them from growing their own food and sugar and insisting on them buying from other countries. And so, we have contributed to the ruin of Haiti, to their lack of food self-sufficiency. They grew a lot of rice, but now they don’t grow rice because they’re forced to buy rice from other countries. In other words, people should learn — students should learn — that the relationship between Haiti and the United States has been the relationship of an oppressed colony to an imperial power. That’s the background of what is happening today. Bigelow: This reminds me of the article that you wrote, “Empire or Humanity: What the Classroom Didn’t Teach Me About the American Empire.” Students have no way to fit Haiti into a broader pattern of U.S. involvement throughout the world. Zinn: Yes. Think of this: Woodrow Wilson is considered one of our great presidents and they talk about him as an idealist who created or helped create the League of Nations, and so on and so forth — for self-determined nations. But he did not want self-determination for the Haitians. In 1915, Woodrow Wilson sent in the army to put down a Haitian rebellion so that the United States could continue maintaining control over Haiti, and that occupation lasted for a long time. It lasted from 1915 to 1934. So again, our relationship with Haiti has been very cruel and unjust and that is the background of what is going on today. Bigelow: As long as you bring up Woodrow Wilson, I want to mention the high school history textbook that’s adopted in Portland Public Schools here. It’s called History Alive! : Pursuing American Ideals, copyright 2008. In its 900 pages, it includes three mentions of Haiti. The first one is in a section called “Wilson Champions Democracy Around the Globe.” It says that Wilson’s “principles were tested by more turmoil in Latin America. In 1915, a revolt in Haiti prompted him to send Marines to protect American lives and investments.” That’s the extent of explanation that students get about U.S. intervention or occupation. Which leads to a question from Robert Roth, a U.S. history teacher at Mission High School in San Francisco. This question came in before the earthquake. Robert wants to know why Haiti is so absent in history textbooks and even in progressive texts. Zinn: It’s a small country; it’s a poor country. And as happens with so many places in the world, it doesn’t loom as important even to the progressive movement. Haiti has been sort of off the map. It’s a very common thing that progressive people who will focus on certain very important issues will neglect other issues, and they’re left behind. Just to give you an example which is a little different, here in the United States, we’re focusing on various foreign policies and domestic policies but nobody pays any attention to the plight of prisoners in the United States. So we have two million prisoners in the United States. By the way, that’s a little nation by itself. And they’re invisible. There are certain parts in the world that are simply invisible and certain peoples of the world. For a long time, Africa, with several hundred million people, was invisible. Much of Latin America is still invisible. Most of our history and history teaching — and I think teachers can corroborate this — or they may tell me that it’s changed — most of our history was about Western Europe, European history. And in fact, only in recent decades with the rise of movements in the Third World did they suddenly start giving courses in world history, Third World history. But Europe has always been the center of our attention when we moved outside the United States. And the truth is, we didn’t move out of the United States very much. Bigelow: Howard, you mentioned the silence around the U.S. empire and the U.S. relationship with small countries. You mentioned the curricular silence and the progressive silence around prisoner issues. What are some of the other silences that you see in the official story, the official history, the curriculum that is taught these days? Zinn: I think immigration and the treatment of immigrants have been ignored, neglected. Now, sure, in recent years there’s been this whole issue of illegal immigration. But the history of this country is a history of immigrants. If only the history of those immigrants were really taught in a serious way and people saw how these immigrants — whenever they came here, in every decade — faced a retribution of some sort because they were immigrants, faced discrimination of some sort. If only that history of immigrants were known: treating them simply as cheap labor, not caring how long they worked, how hard they worked, whether they worked in sweatshops or worked in the mines or mills or railroads, the shabby treatment of immigrant workers all through American history. That history is not told. If it were told, I think people would have a greater understanding of immigrants today and maybe a greater compassion for the plight of immigrants today. Bigelow: Let’s shift gears a bit because I want to get a question in from one of the high school students. This is from Claudia Aviles, a junior at the Bronx Center for Science and Mathematics. Howard, first she wants you to know that “you are an incredible writer and draw me into history.” So you know this young woman has very good taste. Zinn: Oh, very good taste. Yeah. Right. Zinn: Maybe I read more and maybe I was a little more conscious of the poverty of my parents. My parents were immigrants. Maybe they made me more conscious of immigrants and the problems of immigrants. I think reading and also getting involved as an activist. I got involved as an activist when I was 17 years old, going to demonstrations and looking at what the police did to demonstrators when it’s supposed to be a very free country. So I had certain experiences. But I would put reading at the top of the list. I have three brothers. They didn’t read as much as I did and they’re all good people but I went in a more activist direction. Bigelow: Do you think that you carry with you anything from those early years that has influenced your approach to history teaching and activism today? Zinn: I think what I carried with me from those early years is class consciousness — consciousness that the country is divided into a small number of very rich people and a lot of other people, a vast majority of the people who have to really struggle. And not just working people and the poor, but middle-class people, too, are economically insecure. I became aware because I could see how hard my parents worked, my mother, my father. My father was a waiter. I could see how hard he worked, how his feet hurt when he came home. I could see how hard my mother worked taking care of four kids, and they didn’t make any money. They didn’t have anything to show for it. They had to struggle. I knew that there were people in the country, a small number of people in the country, who were multimillionaires. I couldn’t figure out what they did, whether they worked or, if they worked, whether they were contributing anything to society. I became early on very aware that we had classes in this country. You talked earlier about what made me somewhat different. In the United States we don’t recognize that we are a class society. We act as if we’re one big happy family. The Constitution, the preamble of the Constitution begins with the words “We, the people of the United . . . ” — as if all of the people established the Constitution. But that wasn’t true because we were a class-divided country before, during, and after the revolution. The Constitution was not adopted by “we, the people.” It was adopted by 55 rich white men who met in Philadelphia in 1787. So, early on, I developed a consciousness of class, which stayed with me for the rest of my life, and a consciousness that there are always people who are beyond our vision, people we don’t notice. Even when I became a college professor I was conscious of the fact that there are these people who clean our offices. You know, they are the buildings and grounds people. We don’t pay any attention to them. We hardly know they exist and I saw — I think I’ve been conscious of the fact there are always people who work very hard and they become invisible to us. Bigelow: And, unfortunately, they become invisible in the curriculum. There’s silence around social class, as you point out. Zinn: Yes. And labor movements are invisible and, well, here teachers can chime in and tell me how much is taught about the history of labor struggles in the United States. Bill, you asked about groups of people that are invisible and things that are invisible in American history. I learned very little about the labor struggles, strikes of working people. In this country, we’ve had some of the most dramatic and militant and violent labor struggles in the world. And when I went to college and university, and after all I was a history major, I got a Ph.D in history, and yet there were amazing things that happened in the labor movement that I never learned about. I never learned about the Ludlow massacre or the Colorado coal strike of 1930. I never learned about the Lawrence textile strike of 1912 in Massachusetts. I never learned about Mother Jones or Big Bill Haywood or Emma Goldman. Maybe more of that is taught today. I don’t know. Bigelow: No, I think it’s not — at least not in the official curriculum. That’s one of the reasons why we began the Zinn Education Project: to offer teachers around the country alternatives to the official story that was being presented in textbooks, which are probably as silent on those kinds of struggles as when I first began teaching. Maybe even more so, because the curriculum these days seems to be dominated by just a handful of giant multinational corporations. Zinn: That’s a really important question because we all know about discouragement, because we all have become discouraged. It’s easy to become discouraged because you look around at the world, you look at the wars going on, you look at what’s happening to the environment, and you look at how little is being done to stop war, how little is being done to help poor people. You look at the situation in Haiti and you see how not enough has been done to help the people of Haiti and you look at all of that and, yes, you become discouraged. The reason I don’t stay discouraged is I think about other times in history when people have been very discouraged about a certain social phenomenon, but they didn’t just sit and do nothing as a result of their discouragement. They acted, even though they weren’t sure their actions would bring any results. They acted and acted and acted, but still nothing happened and it was very easy to give up. At certain points in history, they did not give up even though they had been discouraged. And if they didn’t give up, if they stayed at what they were doing, if they got together with other people, if they built a movement, then things changed. And there are so many instances in history where this has happened and that’s where history comes into importance. Because if you don’t look at history, if you only look at where the situation is right now, well, you can be very discouraged. But if you go back in the history and look at all the other times when people had been discouraged and realized that very often these people, if they did not allow their discouragement to make them passive, to stop them from doing anything, very often they succeeded in doing things they never thought they would succeed at. I’m thinking of the antislavery movement, which in the 1830s in the United States looked hopeless, but they had a little group of people who were speaking out against slavery — some white people, some black people, escaped slaves, they were a tiny movement. In fact, they were opposed not just in the South. They were opposed in the North by the northern whites. However, they continued the antislavery movement. They refused to give up and the movement grew. The movement grew because these people, as small as they were, they stood for a moral principle, which after a while other people recognized as being absolutely right. Other people recognized slavery was wrong. It took 30 years of being discouraged, but the movement grew and grew and grew. By the time of the 1860s the movement had become strong enough. They could not be ignored. Lincoln could not ignore it. Congress could not ignore it. And the reason we got an Emancipation Proclamation, the reason we got the 13th and 14th and 15th Amendments to the Constitution is because that movement had grown large enough to persuade Congress and the president that they must act. But there was discouragement at the beginning, and you can follow this through American history. Working people, working 12 hours a day, helpless before employers, corporations that had such power — how were they going to change their conditions? It was very discouraging to working people, discouraging to them until they began to organize, until they formed unions, until they went out on strike. And then they found, “Oh, we have a power we didn’t know we had.” And so what happened was the labor movement, which was subject to such disappointments for so long. How long did it take to get to eight hours a day? Long, long years of disappointment. But working people persisted, labor unions were organized, strikes took place, and the eight-hour day was won and unions were recognized and workers got better conditions. And then you can look more recently at the Civil Rights Movement in the South in the 1960s. I lived in the South. Well, you know this, Bill. I taught and lived in the South from 1956 to 1963, seven years, and talk about being discouraged; it’s very easy to be discouraged. If you looked around in the South in 1956, ’57, the South was totally dominated by racism. Whites controlled everything, all political offices. Segregation was as tight in the American South as it was in South Africa. Very easy to be discouraged — but small numbers of people — black people in the South — began to protest and rebel. There were sit-ins, the boycott in Montgomery, the freedom rides, demonstrations. They grew and grew and grew until we had a national movement, and that national movement became powerful enough so that Kennedy had to do something and Johnson had to do something, Congress had to do something and we began to get voting rights for black people, the end of Southern official segregation. We could go on and talk about other movements, but the point is that movements begin with discouragement. Right now it’s very discouraging to see how little has been done about the environment. People who care about the environment must persist. I do believe more and more people are becoming conscious of what’s happening to the planet. Not enough, but those people who are conscious, if they continue to organize and to speak and to educate, that movement is going to grow and it’ll grow to the point where governments — which so far have been so negligent in doing anything about the environment — governments will finally have to act. Bigelow: Amy Goodman says that “the role of the journalist is to go where the silences are.” I think the same thing is true for teachers. You’re pointing out that one of the silences in the curriculum is around social movements — that we need to expose students to the power of social movements as an antidote to despair, as a way of giving people hope about the possibility of what people can do together. It might be worth reminding people that you have a piece that originally appeared in the Progressive called “Unsung Heroes,” posted at the Zinn Education Project website, that specifically addresses this issue of how we respond to student despair. Zinn: That’s a very interesting proposal, commentary, suggestion. I would propose as a master narrative the continual struggle of people for justice, the continual struggle of people for equal rights, because I think this is a theme that runs all through history: the people struggling for a better world. I think all of the information that you can put together in history can fit into that master narrative. You can see the history of the United States as one long struggle for justice by the majority of the American people against a small elite of slave owners, of bondholders, of rich people who have so far dominated our political system and who so far have monopolized the wealth of this country. One long struggle of people for their rights. Bigelow: Let’s end with a question from Nick Schueller. Nick is working on his master’s in education at the University of Wisconsin-La Crosse and will be student teaching soon. Nick wants to know what your advice would be for a future history teacher. Zinn: My advice for a future history teacher is, “Don’t obey the rules.” Don’t be intimidated by what they say you must teach. I realize that there’s a practical problem that you don’t want to get fired tomorrow; there’s a practical problem in dealing with the chairman of the department or the principal, the school superintendent or the school committee — these are practical problems. But you must not be so intimidated that you will just follow scrupulously: “Oh, you must use this book.” “You must follow this curriculum.” You have to play a kind of guerrilla warfare with the establishment in which you try not to be fired. Bigelow: This is from the man who was fired. Zinn: Yes. If you don’t take any risks, you’re not doing the right thing. You have to take risks. You have to be independent-minded. You have to give your students reading materials that they would not ordinarily get. You have to depart from the text. You have to depart from the curriculum. Maybe do enough with the regular text, enough with the curriculum to show that, OK, I’m not ignoring it completely, but no, I’m going to take my students along an independent path. Think independently, think outside the lines that are set for us by the school administration or the politicians. That’s the most important advice I can give to a young teacher about independence and courage and risk. Bill Bigelow (bill@rethinkingschools.org) is curriculum editor for Rethinking Schools.